Renovated Holiday Villas III: CALL US QUICK! • Coffee maker, toaster, blender, etc. • Top quality pots, pans, baking pans, utinsels, etc. 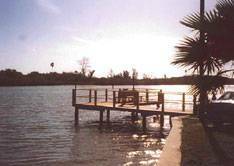 • Private pier and boat dock on intercoastal for fishing, relaxing, dolphin or bird watching, etc. 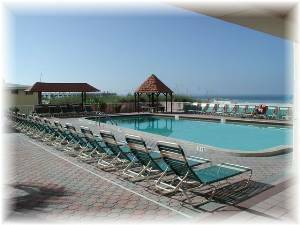 ** We also have OCEANFRONT units in Panama City Beach, FL at THE DUNES OF PANAMA, in Destin, FL at GRAND CARIBBEAN EAST and in Myrtle Beach, SC at THE MYRTLE BEACH RESORT. Well we are home again and freezing in the cold temperatures although it is to warm up on the weekend. I understand that you got hit with some bad weather last weekend and we were glad that we left on Friday morning so we were ahead of it all. We enjoyed our stay at Unit 605 and were very pleased with all the work you have done. It looks great and I hope that your future guests will appreciate it. Thanks again for making our time there so pleasant." "We had a fantastic time in your condo, would love to go back!" "Hello Todd, we stayed there last week and enjoyed it very much. The condo is very, very nice per your description and sunsets were great from the balcony! We are considering a possible trip in Feburary and wondered about availability and cost. We may be flexible on the week but Feb14 is preferred. Thanks." "Good morning, hope all is well. I just wanted to let you know how much we are enjoying staying at your place. We have had a great week so far. Everything is lovely and the view from the balcony is amazing! We have felt very much at home here. We are glad we booked 2 weeks!" "I just wanted to say how happy we were with the condo we rented from you. It is really nicely decorated and we enjoyed the updated kitchen and all of the new china/glassware. We had a great time, the whole building was kept very clean and very impressed!" "We just got back from the week at your condo and it was wonderful. We loved the updates and everything was great. We even saw a few dolphins in the ocean from the balcony. It was a lovely week. Our family from England absolutely loved it." 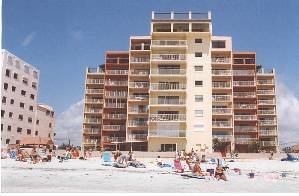 "We searched and searched for a condo at the beach for our Summer vacation this year. We found several locations in the Clearwater/St Pete area but kept coming back to this property- Holiday Villas III. We found this website and spoke with you and you were VERY helpful. Your website has great information and several great photos of the building, the pool area and interior shots of the different rooms in your condo. The photos of the views from this unit looked absolutely fabulous. We compared your unit to several others in the building and based on the photos and informaiton we would select yours. Well, we booked our condo, unit 605 and were pleasantly surprised when we got there! Everything we saw in the photos were exactly how the condo looks. We are really glad after seeing a few other condos in the building, while we were there, that we selected unit 605. 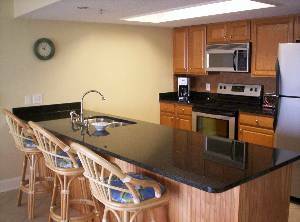 You have done a nice job updating the condo, we love the granite and the updated kitchen. We had friends that stayed in another unit that same week(we will not mention the unit number) and yours was MUCH, MUCH nicer and cleaner than that one. 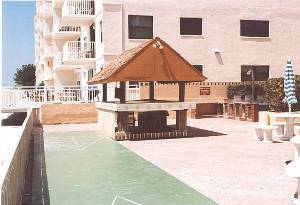 The freshness of your condo really made our vacation complete and the weather was absolutely beautiful. You can count on us as a return guest, we will be back. We just need to make sure we book it before our friends do for next year!" 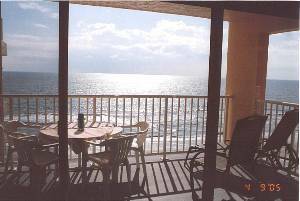 "The week of March 28, 2008 was a great time, the weather was in the 80s and the condo was GREAT! You have a nice pool and great view of the ocean from your balcony. We really enjoyed the added furniture you provide on the bacony! Your unit was clean and we would recommend you to our friends and family." "We'll be checking out of unit 605 on saturday morning...just wanted to let you know we thoroughly enjoyed our stay. I'd like to ask...would you have a rate schedule for a 2, 3 or 4 week stay for next January?? Tenative start date of January 3rd 2009...and how soon would you need confirmation.. Please let me know as we definately want to return to this unit- it was great!" 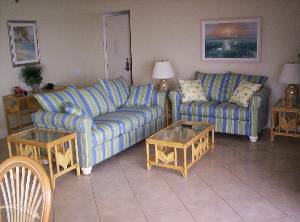 "My family enjoyed our stay in this spacious condo. would definitely return again. The view of the ocean was spectacular."